Welcome to Isuzu Trek InfoLetter #41. The I-Trek infoletter mailing list is now managed in a Google Group: (https://groups.google.com/forum/#!forum/i-trekinfoletter). If you would like to be included in this exclusively Isuzu Trek group please request inclusion or e-mail the editor Bret Medbury for info at isuzutrek (at) gmail.com or islandduo (at) comcast.net. As I drove south this fall, I noticed some oil usage and small spots of oil underneath. My look see revealed oil coating above the alternator and sprayed out several feet. Triple T truck in Rocky Point, NC, diagnosis was failed vacuum pump. They showed me that it is gear driven from a shaft on back of alternator and when it leaks the oil goes into alternator through a weep hole. Also a vacuum line was cracked. One day for diagnosis, second day to wait for part, third day, all day, to install including cleaning. $1,350. It’s only time and money. I wouldn’t worry too much as there is little in the vacuum pump to wear. The alternator and vacuum pump were designed as a unit and while the alternator can work on its own the vacuum pump is dependent on the alternator for bearings to hold the shaft in the proper position. The alternator shaft is splined (shaped similar to gear teeth) to match the hub of the vacuum pump and the back of the alternator is one side of the vacuum pump. The seal that keeps the oil out of the alternator and seals the vacuum in the pump is in the back of the alternator behind the rear bearing. I don’t remember a weep hole but there could have been one in my alternator. Mine began to show signs of oil at the rear of the alternator so I replaced both alternator bearings and the seal which fixed the problem. 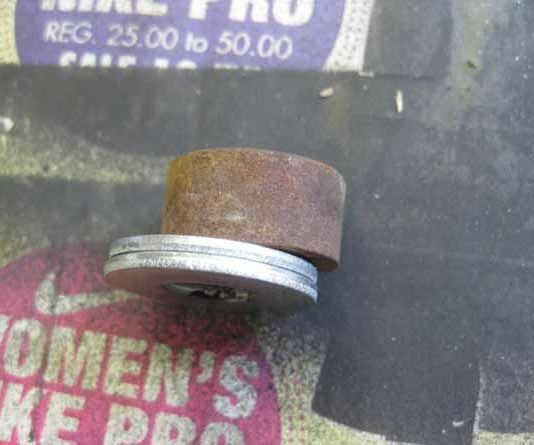 I believe the failure of the seal is caused by failure of the rear alternator bearing and the shaft is not held centered in the seal causing the seal to fail. Both bearings can be matched at Napa but I got the seal from Isuzu. We should all routinely check the back of the alternator for signs of oil. In the last few years I noticed my awning was getting reluctant to roll up into the fully stowed position. I thought it might have been losing spring tension and/or needed lubrication. I reviewed the Care Free Fiesta paperwork that came with the coach and there was no service information. I called the manufacturer in Denver and was told they do not provide service information to owners and they do not do service work at the factory: “Contact your dealer”. I looked closely at the castings at the forward and aft ends of the roller and tried to see how it was assembled. I was reluctant to take it apart until I understood the spring system. Later, while at a rally, I talked to an awning service writer and for $20 they sent two service technicians over to service our awning. 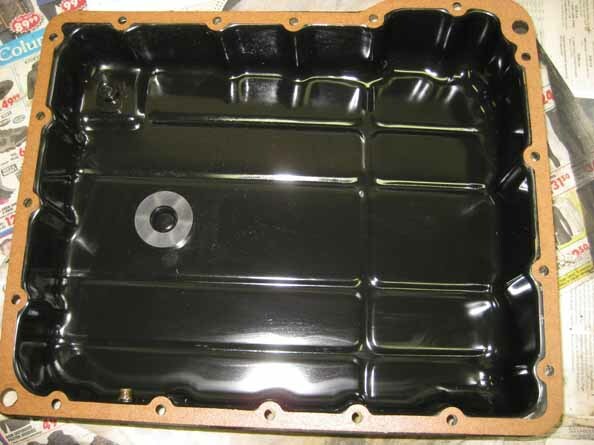 First, they said the bearings in the end castings were teflon and usually did not require lubrication. The technicians did use a liquid spray with teflon powder in it for general lubrication of the aluminum sliding parts of the awning (it can be found at Lowes: Buster Corporation Dry Lube with Teflon). They do not recommend WD-40. Resetting the spring tension turned out to be easy. The technician started with the awning in the normal extended position and the aluminum arms in place. One technician was on a ladder and the other standing by to assist at the forward end of the awning. Vice grips were attached to the web of the casting so the handle was perpendicular to the center of rotation of the awning tube. This provided a handle to resist the spring torque and to help wind the spring tighter. Then the bolt that attaches the casting to the end of the strut was removed. While holding the casting and vice grip, the casting was slid off the end of the aluminum strut while resisting the spring torque (can’t remember if the release lever needed to be activated). Then they turned the casting assembly 2 or 3 turns to increase the spring torque and reinstall the casting on the strut. During the whole operation the second tech stood by to assist if needed. The awning works fine now. Cleaning. Do you have the original Trek awning? The one that looks like coarse cotton fabric, kind of off-white with “TREK” on the skirt. Over the years my awning turned dark and looked dirty, with leaf stains and sap spots. Awning cleaner did not help much and I was starting to think about replacing the fabric. Then I tried pressure washing it up from the bottom and found it did a good job of cleaning it. You will get wet standing under it but the spray will penetrate just enough to lift the dirt and some of the stains up and out of the fabric. Do not get too close to the fabric with the spray nozzle and start near the coach and work outward. Before starting, inspect the fabric closely, if there are small spots where the fibers are frayed use super glue to bond the fibers back together to keep the fabric from fraying under the intense pressure of the spray. After leaving the 2018 Quartzsite Trek rally and arriving in Yuma we began to have problems with our transmission. Starting from a stoplight the acceleration was weak and it felt like it was in the “safe mode” of just using the torque converter. I stopped and tried turning the engine off, moving the shift lever through all the positions several times and restarting the engine. The vehicle would move but was still very sluggish. I stopped, removed and reinstalled fuse #11 to reboot the transmission computer. The transmission worked OK long enough to get us to our campground. We called around Yuma and found Ramco Transmission Company. They were willing to work on the JATCO (Japan Automatic Transmission Company) AK106 transmission and we made an appointment for later in the week. While waiting to get the coach in the shop I reviewed the service manual “Self Diagnosis section 7A1-20” and the diagnostic procedure. 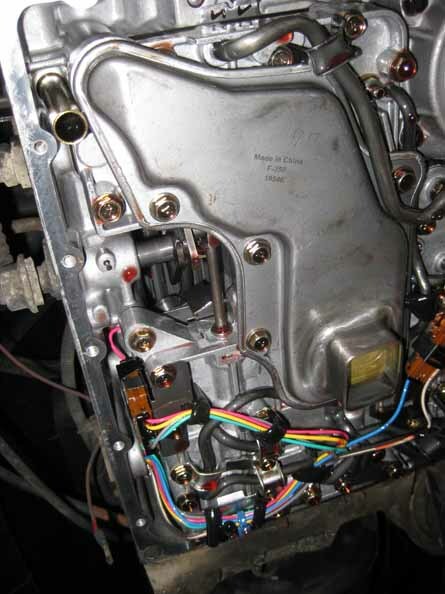 To get the codes you can use a modified paperclip to short out two wires in a white plastic 2 pin connector (about ½ by ½ by 1/4 inch thick with a black wire and yellow/black wire) near the steering column. The codes that were flashed through the Econo light on the dash were 13 & 24. I reviewed my service manual with the technician and it shows there are three sensors sending information to the transmission computer to shift gears. 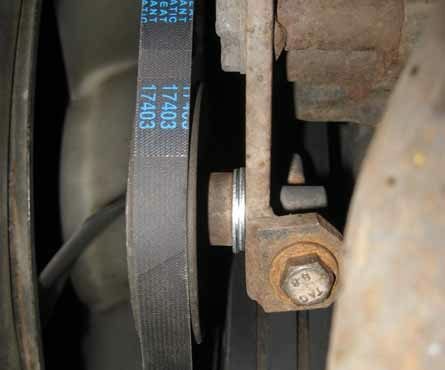 Code 24 is for the Vehicle speed sensor #2 that gets a signal from the speedometer (Vehicle speed sensor #1 comes directly from the transmission and if it was defective it would show code 11). While talking to the technician I remembered that I was having a problem with very large fluctuations of the speedometer needle from 5 mph up through 35 mph . The shop was sure my problem was not mechanical but I would need to return later to get the electrical problems diagnosed. Back in the campground I removed the grill for easy access to the cruise control unit and found the speedometer cable from the transmission was loose and nearly disconnected from the cruise control. Reinstalling the cable and test driving the coach showed the fluctuation problem was solved, the transmission computer was now getting good input, the transmission shifted good and there was no more code 24. As I understand it the computer looks at two sources for vehicle speed: the transmission sensor and the speedometer sensor. It likes to see both sensors agreeing on the speed, but it will pick one or the other if there is ongoing bad or lack of input. In my case the fluctuating speedometer was sending erratic signals that caused the transmission to go into the safe mode. Code 13 was still showing up occasionally. The technician said this Engine Speed Sensor tended to get weak over time (now 24 years old) and could cause the transmission to stop shifting. I elected to get this sensor replaced. My understanding is the computer needs a good vehicle speed input (two sources) and a good engine speed input for the transmission to shift and lock in each gear. If good vehicle speed input and engine speed input are not available it will not shift. Note 1. My coach was built with a four-piece speedometer cable setup. The first section went from the transmission to a coupler above the front axle, the second section went on to the cruise control, the third section went from the cruise control up to a coupler at the firewall and the fourth section to the speedometer. Over the years I had numerous problems with the first two sections so I replaced them with a single new cable and have needed to lubricate the whole system several times. Note 2. I have installed a very small normally open push button switch in the white two pin plastic connector mentioned above so it is easy to get the codes when stationary or moving. Shortly after buying the Trek I purchased a set of Ellis Safewide wheels that could mount low pressure tires to improve the front end ride. The tires were 33×12.5-16.5 (33″diameter, 12.5″ wide to fit on the 16.5″ rims). This tire could carry my front weight with just 45 psi pressure (the 5psi was a safety margin). I had to bend the front wheel well fore and aft splash guards slightly to add clearance for the tire. The Ellis wheels worked fine for nearly 20 years but eventually all the tire manufacturers stopped making radial tires for the 16.5″ rims. Ellis had made a few 16″ rims for low pressure tires but they are now out of business. After a lot of searching I found Brian Light at West Coast Wheel & Rim, 197 S 1st Street, San Bernardino, CA 92401, Phone (909) 266-4929, email brian.wcwr@verizon.net. Brian made two 16″ wheels with 8″ wide rims with the Isuzu lug pattern for me. The tires I selected were Uniroyal Lorado all weather 285/75 16LT (32.83″dia, 11.22″ wide tread, for16″rims) load range D rated for 3,305 lbs (also available in Big O brand). The tires have 2 ply polyester sidewalls and the belts are 2 ply polyester with 2 ply steel. Using the tire load range D chart the tires can be run at about 47.5 psi for the weight they will carry. I am running at 52.5psi to have a 5 psi margin. The wheel and tire combination are providing a soft ride and track very well. My transmission was slightly slipping in first gear until it warmed up. All levels checked good. It was getting worse. On advice of others at Quartzsite I tried TransX treatment and it didn’t work. One of the TT discussions suggested checking filters. I had previously changed the fluid without changing the internal filter (strainer) so before doing anything else I dropped the pan and found that the internal filter was just hanging loose so I was not getting fluid sucked into the trans until it expanded enough to be. Changed the filter, tightened all bolts and JOY. Trans is once again perfect. During this last winter’s trip south our Generac NP-52G propane genny developed a bit of a quirk. Sometimes it would start, run for 3-5 seconds just great then drop to one cylinder. Once running on a single cylinder the dead cylinder never even attempted to fire again. The following is an abbreviated sequence of troubleshooting steps. Steps 1-8 were completed in the first couple of days after the problem became evident, the rest at home. Check temperature of the plugs, left cylinder cold. Check plug wire, nothing found. While manually manipulating throttle, overriding the governor, I discover at a forced reduced throttle opening the second cylinder will begin firing and once stable it will continue to run just fine, however if either I force the throttle suddenly open or the governor does the left cylinder dies again and stays dead till throttle is reduced. The mechanic (me) determines the left cylinder ignition coil/armature is weak therefore incapable of providing adequate spark at increased cylinder pressures. This is something I am not going to fix on the road and since I have a method of getting the genny to run correctly each time Laura wants popcorn (about the only time we really use the genny) we are good till we get home. Swap the two coils/armatures, no joy. Again make GROSS changes to mixture which interestingly has zero effect. While the genny is happily running along on both cylinders the mechanic (me) gradually starts closing the propane supply valve at the tank and at a specific point just one cylinder dies, reopening the valve does not result in the cylinder recovering. Let it run for a while on that one cylinder then check plug temperature, left plug colder. An item of note the bad propane regulator had been replaced by me, soon after Trek purchase, at the end of 2011 as I will not use a regulator for more than ten years (separate subject) and the previous regulator was original to the Trek, so this regulator was about 7 years old. It appears as though it was restricted somehow although I do not know what is wrong with it and do not care. Remember that old mechanic’s rule that “95% of your carburetor problems will turn out to be electrical”, well this is one of the five percent. 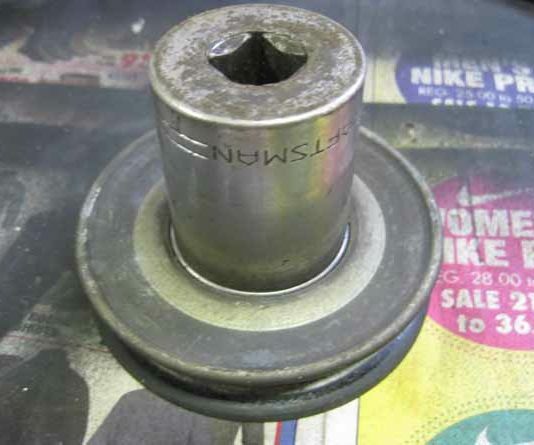 The Ball bearing in the idler pully for the AC drive belt started “talking” to me. Removed the pulley and spun it in my hand verifying it was bad, really bad. This bearing is down low where the road crud and weather get to it and even though it is a sealed bearing eventually they die. The bearing is a 6203-2RS (2RS = rubber sealed, both sides) it is 17mm inside diameter, 40mm outside diameter, 17mm wide. 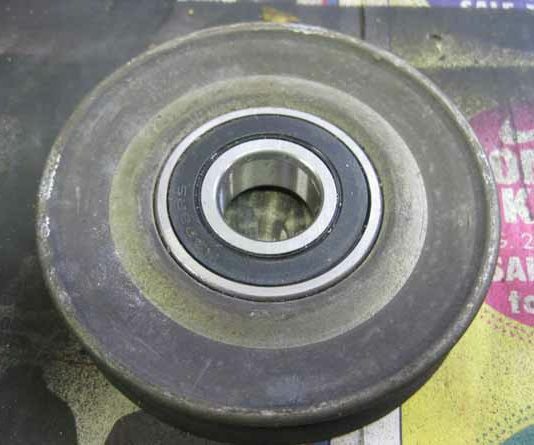 The old bearing is driven out using an appropriate size scoket as a driver and the new one tapped in driving moderately on the outer race alone. During reinstall I noted that this puller did not exactly align with the other two (it aparently never had) so I used two washers to space the pulley forward into alignment. The old belt was a Mitsubushi P/N 8944529040 which crossed to a generic P/N 17403 replacement. Remember you can submit items for this infoletter at any time and I will include them in the next issue. Anything you feel would be of interest to another Isuzu Trek owner is welcome. If you missed my previous notifications, thanks to Denny Jones, one of your fellow Isuzu Trekers, I have CD copies of the Isuzu chassis parts manual which includes all chassis parts for model years 1987 thru 1994. If you would like one please contact me. To cover the cost of the Cds and mailing etc. It is yours for $3.00. Having this is a great asset because using it you can find a part number for that widget you need and with the part number you are far more likely to find an available part. You are no longer at the mercy of the guy behind the parts counter. FYI for any of you have not already converted your Trek interior lighting to LEDs and are looking to do so at a reasonable price, please get in touch with me. Life is getting wicked busy and I am not sure how much longer I am going to continue doing this. Kinduh depends on the square root of the phase of the moon. I would not want you to come to me for LEDs after I have retired as then you would be forced to pay retail for them. OBTW I will most likely not be able to respond for a couple of weeks after this newsletter hits the street.